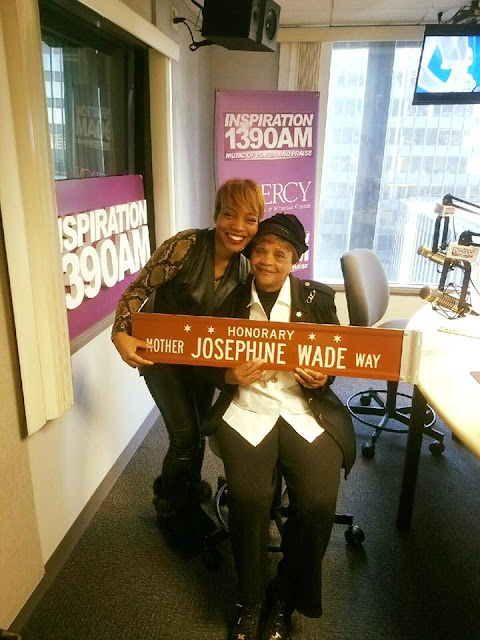 Josephine "Mother" Wade , owner of Josephine's Cooking (formerly known as Captain's Hard Time Dining), at 436 E. 79th Street, has had a very good week. This weekend, she was honored with a stretch of 79th street named after her, in an honorary street sign. The event was attended by several community leaders and politicians. She was also featured in the most recent issue of the African American Tribune (on the cover and a story; the issue is available in many places, such as churches). Today she was on the morning show on Inspiration 1390 AM with Sonya Blakey. She talked about her history with the neighborhorhood, community involvement. She also noted that she actually wanted to keep the name Captain's Hard Time Dining. Her son, in consultation with others, thought it would be better branding to not have "negativity" (i.e. "Hard time") in the name, though she noted that the name change threw a lot of people off. She also shared th emany connections she has in our city and community. I (JP Paulus) even called in, and with a short description was able to identify me. (I am not sure if that aired...I called around 8:45 am but didn't hear it in the next hour). She definitely has the gift of connection. Mother Wade was in the restaurant shortly after her appearance on 1390AM, and might still be there if you stop by today to wish her Happy Birthday!